Three years ago i started a blog, I told you everything, major and minor. I abandoned you last year and i'm sorry. Life's been hard but it'ds getting better. It's time for a change for a new start. So here goes! Wow what a few months, I have been neglecting you haven't I? It's been crazy and my head has not been in the right state for blogging. I've not been very focussed on my work at all and although I am still suffering from sheadheaditus I'm am forcefully pulling my finger out. So what's been going on then? Well, not much really although we do have a new addition to our family, well six actually! We adopted a stray kitty that had been living in my mums garden, she was so sweet and friendly and I couldn't resist taking her in. She was also heavily pregnant and I couldn't let her give birth outdoors and risk the fox getting the babies so we took her in and a week later out came six balls of fur. Sadly one of the kitties wasn't feeding properly and died a couple of days later but the other five are doing well. They are three weeks old now and so cute, the can't quite get out of the box yet but I can tell that they will be trouble once they can. We are going to keep kira, the mummy and one of the kittens and find good homes for the rest. 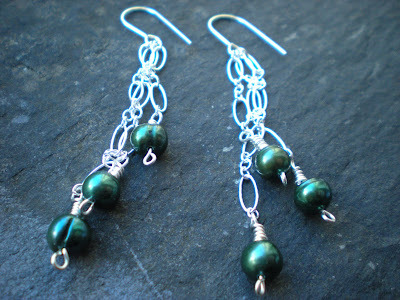 Swarovski Crystals and pearls wrapped with sterling silver wire. I'll be back soon with proper post, life's a bit mental at the moment. I'd like to introduce you to the newest addition to my bead family. 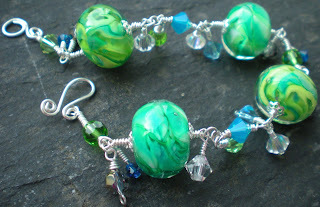 These gorgeous aqua glass crystals are approximately 12mm x 8mm and are really striking. I have bought these in a few colours recently, all beautiful but these are my favourite. I've not decided what to do with them yet but I'll show you when it's done. Wow is it really Easter already? So it's officially spring and am I glad to see the back of Winter. I don't care if it snows or rains, in my head it's spring. It's been a crazy few months, winter is the busiest time of year at work and it has been seriously crazy this year with the extreme temperatures. Team that with the launch of a new business, jewellery designing and endless craft fairs and you've got a hectic few months. On Sunday I attended my first craft fair of the new year as a seller only. It was a little quiet but as always a good day out. I have another one this Saturday at Pudsey. I was surprised to see just how little stock I currently have but as I now work exclusively in silver it's hard to have a large amount of stock as it's so expensive. 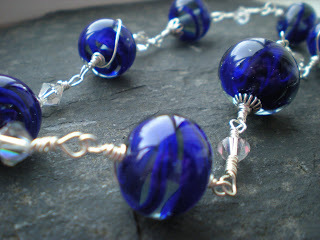 So this week I am going to make as many lovely new pieces as possible ready for Saturdays market. Then on Monday it's James' birthday. Not sure how we will be celebrating yet, that probably depends on how successful Saturday is! This weekend I have said goodbye to two of my favourite pieces. I've obviously happy about this but I'm also a little sad, I'm going to miss them! 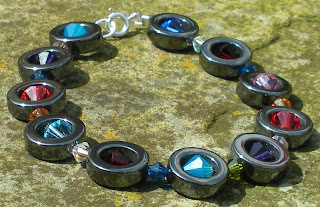 Well I finally got round to making myself a bracelet, I still haven't managed a necklace but I'm getting there. I've used Swarovski 6mm bicones in Crystal moonlight. It's actually a bit too big for me, how I've managed that I don't know! I've made it specifically for a murder mystery evening, James' mum bought me a lovely navy chiffon dress and it compliments it brilliantly, also the dress is a size 10 and fits perfectly! Wow this weekend has gone fast! Friday night I met up with Carrie for a couple of drinks which turned into considerably more than that! I had a great time, it was a lot of fun. Saturday morning however was not, it wasn't the worst hangover I've ever had but it wasn't great. Carrie and I went out to check out some potential venues for fairs. We are very keen to get a lot of dates booked up quickly so we can start to advertise. We are already booking venues for Christmas! By yesterday evening I was so exhausted but we went to Asda and did our weekly shop. Bought GI Joe on DVD (A decision we would come to regret) and came home and somehow I managed to stay awake for the duration of the waste of £7 film. This morning Carrie and I went to the gym. it's been too long since I went last and I got tired easily, still I went and I'm glad. Achieving small goals and taking positive actions really increases motivation. I'm not focusing on my large goals, they're always there in my mind but I like to look to the smaller, attainable goals. Afterwards James and I went to Crofton Heronry tor a walk. It was nice to have some time with James, at the moment I seem to be doing a lot of things without him so it was nice to just have a walk around the lake. Afterwards we visited James' parents and came home now I'm here, talking to you! Carrie has been working hard building a website tonight so hopefully very soon we'll be able to show you that too. The next event we have planned is at Oakwell Hall on the 6th June. We are going to book a venue between then and now somewhere soon. We have a lot more venues to see and a lot of them look really promising. Oakwell hall is am amazing venue, we have big plans for advertising and we are really confident that any fairs we hold there will be incredibly successful. I'm feeling good at the moment. There are a lot of positive things in my life and things are only getting better. If only I didn't have work in the morning things would be pretty darn perfect! I've recently developed a love of Charm Bracelets. Although some people have looked at them and said "they're not charm bracelets" I think they are, the "charms" are crystals. 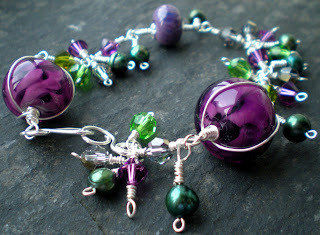 I love green and purple together. I can't believe how gorgeous the weather is today. I think I speak for the rest of the country when I say "at last!". 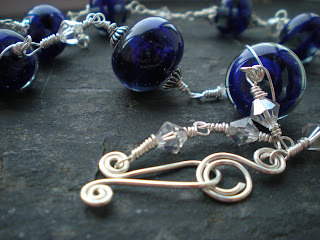 I've just been out in the garden with a couple of pieces and taken some photos. The weather was great yesterday too but I didn't see much of it as it was our second craft fair. It was a little quieter this time, maybe because of the weather. It was the first really good weekend day for months and I would have probably gone out somewhere myself. I've had today off work and it's been lovely. I got up at leisure (about 10am he he) and went out into the garden to take some piccies. I can't quite explain just how lovely it is to see such bright blue skies. Unfortunately it's back to work tomorrow which is a shame, I love days at home! On Friday I finally joined the local gym. I went with Carrie who has been going for a few weeks. I was disappointed to see just how unfit I actually am. Luckily I don't have any muscle aches today, I obviously didn't work hard enough. Now though because of my epilepsy I have to get a doctors note to say that I'm okay to go. So I'll call them up in the morning which will hopefully mean I'll be able to go tomorrow night. My weight loss has slowed down so I'm pulling out all the stops this week. I'm going to measure all my food out and only drink water alone or with lemon. For inspiration I can look at the horrible picture below. This was taken on my honeymoon and I could easily dwell on the fact that didn't lose weight for it or my wedding but I won't because frankly what's the point? I'll save the energy for the positive things I'm doing now. I haven't received my vouchers yet so the makeover is yet to happen, I'm still jegging-less. 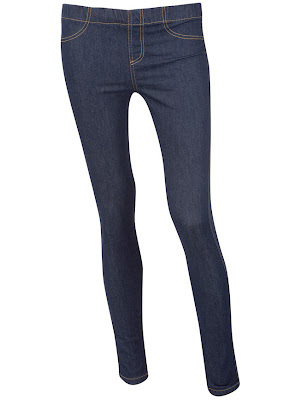 I love shopping so I can't wait to get them. Once I have I'll post a picture and see if there is a difference. So I feel the need to share... I feel sorry for my right eye. My vision is perfect in my right eye so my eye liner is always perfect on my left eye. My vision however is not too good in my left eye so the eye liner on my right eye is always wonky. Doesn't seem fair does it? I'd definitely a sparkly girl, I love the twinkly things in like, I even love the words sparkly and twinkly. 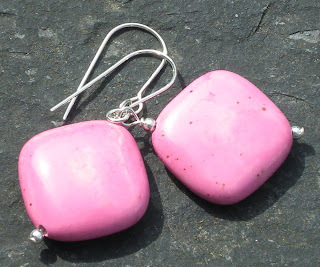 These earrings are not for casual wear they are for best. Didn't you just hate that when as a kid your folks would take you out and buy you a new item of clothing like just for example a swirly dress and then tell you it's for best. "No you can't wear it to play on you BMX"
I wanted to be a BMX princess! I'd strap Barbie to the front and do the best wheelies! There's a mixture of clear and silver shade Swarovski Crystals with sterling silver chain all wrapped together. 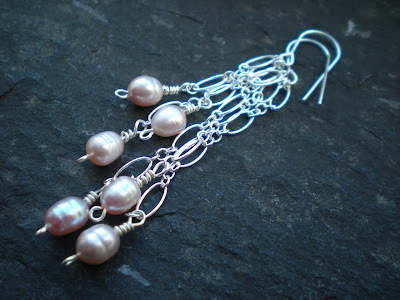 I had forgotten that I made these a couple of months ago, not my finest work of art especially as all I've done is attach some chain to an ear wire but I like them. Hammered sliver chain and an ear wire. I think I'll make a pendant to match the spangly earrings next. We're going to our friends house on Saturday night so I'll get to wear them there. Bring on the weekend! Since joining weight watchers I've lost 8lbs which isn't loads but my ultimate goal is to lose 28lbs so I'm getting there. I've had ups and downs (Christmas and my Birthday) but with no major celebrations due for just short of two months I've got a clear run at my goal. Last weeks loss was 3.5lbs which really boosted my confidence so no I need a mini makeover. 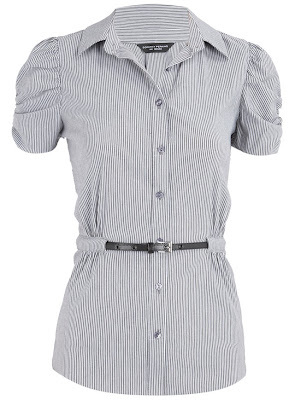 Shirt and Jeggings from Dorothy Perkins. Teamed with my knee high boots for a casual look, some heels to dress it up and my beloved flip flops in summer (not all at once of course!). On a vaguely related note I've decided to join Carrie http://www.lifechanges-uk.co.uk/ and do the race for life in July. It's only 5K but I have never been a good runner, I have no stamina so I'm going to have to train for it so when payday comes around I'm joining the gym Ahhhhhhh! I'm going to have to work really hard to achieve it but it will really help my weight loss too! Well I didn't sleep well at all on Saturday night. So many thoughts running through my head, will the stall holders turn up? will customers turn up? I was so worried that it would be a total disaster but quite the opposite. From the doors opening t 10am right until 4pm there were people there. Carrie and I were so happy and relieved. We certainly put the work in. A local newspaper ran an article and will do a follow up for us and we both delivered a lot of flyer's. this was all in addition to online advertising. We've booked another one for the 7th March at the same venue just in time for mothers day. We are going to hire all the rooms and have more stalls. I'm going to have to limit jewellery stalls as over a quarter of the stalls were jewellers. 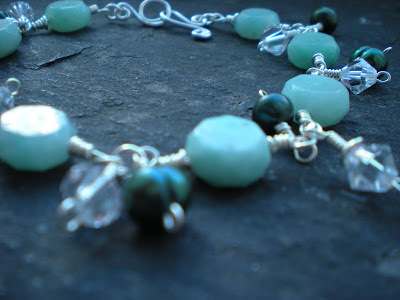 My dilemma is that I now know a few jewellery sellers and I'd love to give stalls to everyone but I can't so I'm going to have to book on a first come first served basis. I think we do need more variety this time. Many of the craft stall holders said that they weren't expecting to make much money as it was a first fair. I was very happy that they came despite their lack of expectation, I really appreciate their support and was very happy that their expectations were exceeded and most made a healthy profit. Ultimately despite my nerves I knew we could do it and we were right! I'm very happy. 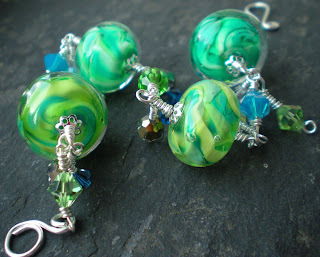 I know that you have all seen these pieces before but I'm showing off the Photography more than the jewellery. It's the hardest part for me and every now and again I see my photos getting better and it makes me very happy. It's amazing how much time running your own business takes up. I made a long to do list today and I've not got through half of it. I've compiled a data base of all bookings for next weeks fair, taken photographs of my new pieces (as we finally had some sun) updated Etsy, updated my website, updated my facebook page, visit the craft fair venue and updated my blog. This is the last thing that is going to do today. 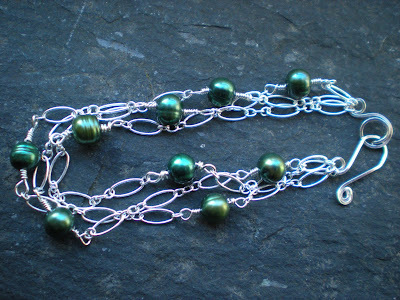 I haven't made any jewellery which is annoying. I really want to finish the piece below. It's a little wasp like, made using black obsidian and crystals with yellow fresh water pearls but I like it. How cool is it that the recession officially ended in the UK today? What's even better is that today is my birthday. What a nice present to receive! I'm 28 today and I think I'm going to enjoy it. Firstly I don't like odd numbers, I always look forward to my next even number. Not sure that will be the case when I'm 29 though! Secondly 2010 is officially my year! I have a good feeling about it. I received an order of silver wire today. 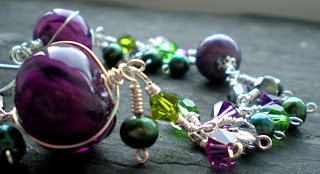 I have lots of beautiful gems pearls and crystals but no wire so I haven't been able to make! 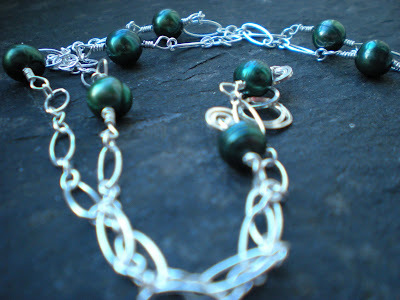 then once I have made lots of lovely new pieces I can photograph them and add them to Etsy and Coriandr. I've never really given my shops the TLC they deserve. I've never spent enough time doing online marketing but now i have this beautiful Laptop I can. Thirdly, my first Craft fair is less than two weeks away and I am so excited about that. Organising it hasn't been as easy as I hoped. Last week we had to change the venue as the local council were being very obstructive. I had to practically beg the market department to give us permission to hold the thing and then when they finally relented the charge for a license to hold it was so extortionate that we would have made a large loss. Our stall fees are low because I want to provide sellers with a great venue that wont break the bank. I was paying £50+ per stall before Christmas and making a loss. 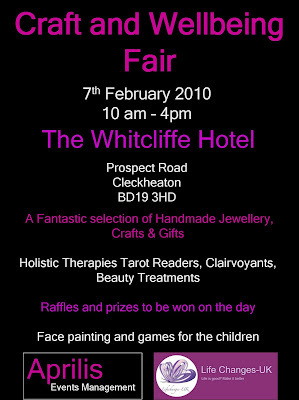 I'm happier with the new venue at www.thewhitcliffehotel.co.uk It's a lovely hotel, I got married there! Well I have a half made amethyst and pearl bracelet that isn't going to finish it's self so I best be off. I am happy to report that I am typing this post on my new laptop. James and our families have very kindly bought me an acer aspire called Alexis for my birthday. I'm having a little trouble with the A key. It wasn't working properly but I've restarted it and it all seems okay now, fingers crossed! I've become quite attached to Alexis and I don't want to have to take her back to the shop. So now I don't have to sit on a barstool hunched over PC in the spare room. Na, the A didn't work then. Ah sorry Alexis, you're going back! Took her back and swapped her. Alexis mark 2 is good to go! Pieces within the decadence collection are made using handmade lamp work beads, Swarovski crystals, fresh water pearls and sterling silver. 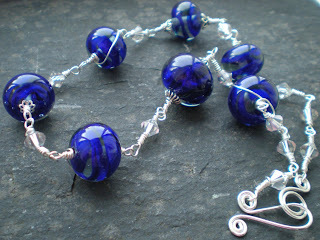 The Lampwork beads are made By Nial at Flame Jewellery http://www.etsy.com/shop/Nial Nial makes the beads and his lovely wife Sarah turns them into gorgeous Silver Jewellery. Like many people towards the end of any year I become very reflective. The instant boxing day is over I look to the year ahead and back at the glowing embers of the one passing. I was thinking about how my life has changed this year and I visited Rachel's blog and she made me realise that we are not just looking back over a year but over a decade. My first decade as an adult has been incredible. Ten years ago I was in the final year of my A-levels, eight months away from university, I hated school and couldn't wait to escape. A summer job and several weeks of nervous anticipation of exam results were all that stood between an excited 18 year old and the rest of her life. University was all I hoped it would be, although I still lived at home with my parents I had a great time. Six months after graduating I met James two days before my 22nd birthday, three months after that we moved in together four years later after buying our first home we married on the 25th May 2008. Somewhere in and amongst all that I met a lady who worked for a cosmetics company - you know the party planning kind. She wanted to recruit me and I was genuinely considering it until James said, If you're going to do parties why not sell your jewellery? Why not work for yourself? That's two years ago now and whilst I may not have had the meteoric rise to success I had initially hoped for I can see that I am well on my way. The first of January 2010 is the launch date of my newest venture Aprilis Events Management. The launch will be sadly lacking in Champagne and canopes as it only exists in my head and on my blog but it exits none the less. I have sold my wares at good and not so good fairs and I have learnt a lot from each one. I have realised that a sellers perspective is absolutely intrinsic to the success of a fair. Many organisers see the selling of all stalls as the ultimate goal at a fair which of course is their wage for the day. I however will only see my fairs as a success once I have provided my sellers with customers. I wish to cultivate a successful and loyal band of sellers by helping them to make a profit. I realise that this is a challenge, especially so due to the financial climate. Lets face it, huge retailers throughout the world are collapsing before our eyes. I still believe though that as big business falls small business can rise. This all sounds very grand when in fact I'm a little nervous of my new venture but I'm confident that the only way I'm going to make my life my own is with the stubbornness that comes naturally, the confidence that does not and working my arse off. Ten years ago in 1999 a 17 year old looked up and the fireworks filled with nervous excitement at the years ahead, tonight she does the same. Here's to making this decade worth writing about. Oh boy what a few weeks I've had. Markets all weekend, work all week, normal life squished in and amongst. Tomorrow will be my first day off in weeks and I am soo happy I get to sleep in! Yay! The markets haven't been very successful. I was hoping to better the success the summer offered me but alas I haven't even equaled it. A new strategy will be developed for next year as I've learned a lot this year, it's been an informative experience. Anyhoo, got to go, QI is on in a mo and then it's early to bed so Santa can do his thang! Once again I had a great time at Ripley yesterday and this time I did make a profit but it wasn't huge. It's a shame because the location is beautiful but just too quiet but you never know till you try! I think in the summer months when there are other events on locally it will be an excellent venue but in the cool autumn months the majority of people I saw were ramblers. I was in reflective mood yesterday on the way home and I was thinking about how the last year had been. I was so nervous about my first Craft Market at Holmfirth back in February yet by Christmas I will have done 31 market stalls and a few jewellery parties and local events too. I was made redundant around the same time and things were scary for a while. Luckily that turned out okay in the end. I have around 10 markets between now and Christmas and they will really set the tone for next year. I never really make proper new years resolutions but I have a good few for next year. I honestly believed at the time that 2009 could be my year and in many respects it has been but I was naive to think that I would leave work so quickly. I have learned a lot this year and been forced to accept that this is going to be a lot harder than I had expected. One thing this has shown me is that I can do it. I've never worked this hard for something I've wanted and I don't have to push myself I just do it. The rewards are worth the effort. Recently, thanks to someone else, I have realised that I would love have my own events management company, organising fairs and such. This would ideally be in partnership with someone else and would really help me leave work. I have a mailing list of a lot of artists who have expressed an interest in attending such an event and I think that I have found my first venue. I'm keeping quiet for now but hopefully I'll be able to get it booked and begin the prep very soon. You see, I'm pretty confident about this because as a regular stall holder I know what I want from a fair. I've been to successful and unsuccessful markets and I've learned a lot from both. Here's a little progress report. 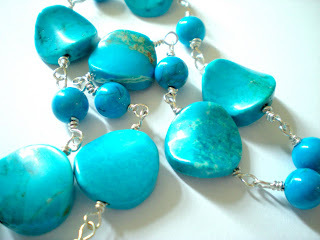 I love anything creative especially jewellery making and music. I love going for walks in the country and visiting stately homes (although i hardly ever do!) I love open air concerts in parks, I love picnics in the summer and open fires in winter. I love the end of summer, when the nights draw in and the leaves turn golden. I love it when the Christmas lights go up in the towns. Drinking Gluhwein at the Weihnachtsmarkt in Leeds. I love the spring when the long winter is drawing to a close and the flowers are blooming. I love daffodils, how they bring with them the spring sun and rain. I love waiting for summer, i love taking off the big coats and woolly jumpers and putting on flip flops. I love the colours of the seasons. I love sharing all of this with those I love. .Original Papercuts, Original Art, Collage and Postcards.